Digitain the multi-channel sports betting and casino platform provider announced that it is won the Notable Company in Gaming at this year’s Balkan Entertainment & Gaming Expo – BEGE awards in Sofia, Bulgaria. Before the superb awards evening Digitain presented its latest innovations and developments at BEGE EXPO which is now in its eleventh year and attracts over 5000 international visitors from 35 countries, more than 80 companies, situated in 3 halls exhibiting at BEGE. Digitan spoke about its Sportsbook Software product and demonstrated the latest developments in Skill Games, along with multi-channel business solutions such as terminal, Sportsbook iFrame and bespoke API solutions for today’s operators. 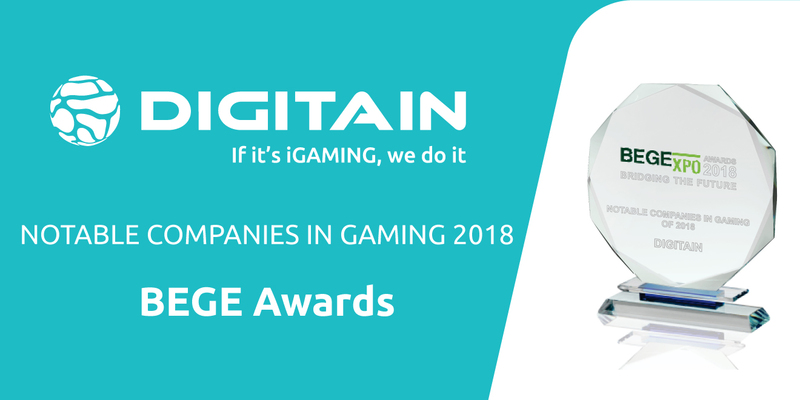 “As a result of more than 15 years of experience in the gaming industry it’s very gratifying to win this award at BEGE Expo 2018 which is due to our continued focus on stable and scalable technology and our continued dedication to improvements and development of our gaming products for our customers and partners,” said Suren Khachatryan, Digitain CEO. Digitain has more than 1,000 employees, 55+ global partners, and more than 400 betting shops worldwide.